“WOW!” That’s what I was thinking pretty much the whole time during my 4 days stay at Bodhi Temple (Thousand Buddhas Temple) in Taiwan. The temple is not a tourist attraction with lots of visitors. 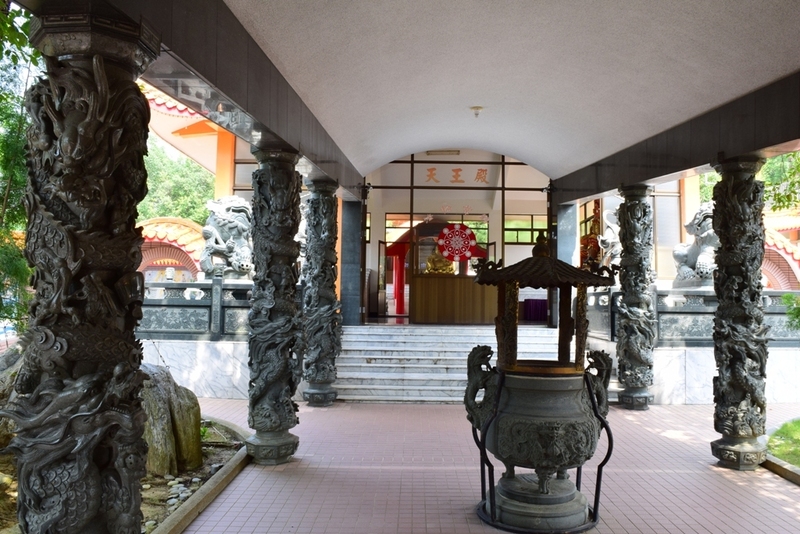 Though it is a quite big temple somewhere in the countryside close to Tainan city, hidden between trees on top of a hill. 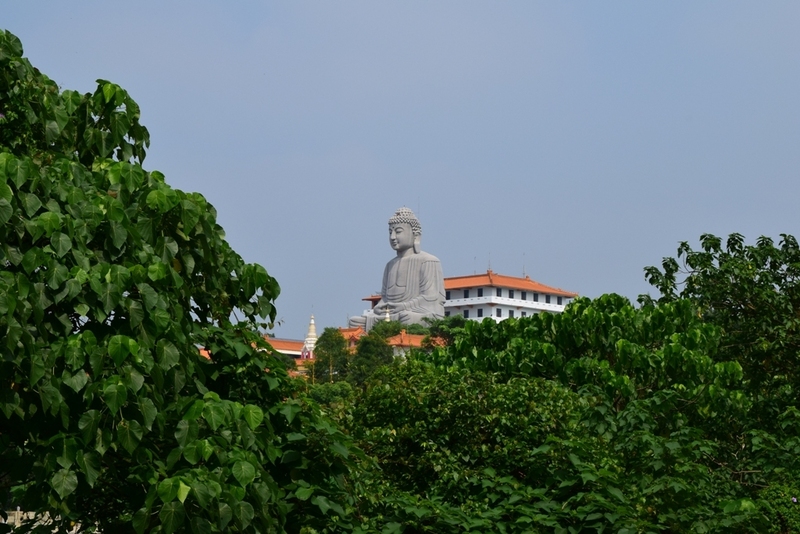 You can see the huge Buddha statue and parts of the temple from far away. I’ve seen documentaries here and there about Buddhist temples in Thailand and learned that the monks are not talking in most of the temples and that you have to remain silent in the temple the whole time. So I prepared for 4 days of silence when my friend invited me to visit her in her temple in Taiwan. I thought, wow that is going to be super hard. No talking when I actually haven’t seen my friend for 4 years. 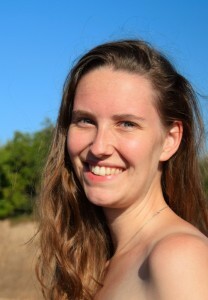 About a month before I arrived she told me that she looked different and that life in temple has changed her. I got to know her in Australia as a super funny joking happy person, laughing all the time. I was kind of sad, that I might not meet her like that. But I knew she feels happy in the temple, so I didn’t care that she might have changed. Then the day came when I was meant to be picked up by her at the train station. The day before she told me that she wouldn’t be able to pick me up but two other nuns would come instead. I must say I was a bit worried because I actually had no idea how to behave towards people that are living in a quiet way and do not talk (a lot). When I got off the train I was excited but still a bit concerned about how to behave. I was walking towards the exit of the train station when suddenly there were two small nuns standing in front of me … wearing base caps and their traditional brownish linen dress with a big smile on their faces. They welcomed me and gave me a bubble milk tea saying “This is for you, it is typical for Taiwan, try it!”… That was the first WOW. You can imagine that I was a bit confused, thinking “What’s going on here?”, and on the other hand I loved them from the first word they said. They were so caring and seemed so happy. And I was happy, too, sitting in that car, talking to 2 nuns, who were asking me lots of questions while driving to the temple. When we finally arrived I got nervous again. How is my friend going to behave? Then I saw her. I saw that little cute nun from far away smiling at me. I carefully walked closer and was super happy that she hugged me because I really wanted to hug her too. And it was so cute to see a few tears of happiness in her eyes. Maaaan I can tell you, I had to fight back my tears. There was the next WOW. This one is because she hasn’t changed at all. Still that lovely cute girl/woman, smiling and laughing all the time. Ok she has a bald head and is wearing different clothes, but apart from that she is still the same that I know from 4 years ago, even if she is living a totally different lifestyle. I was amazed by her and the other nuns. Everyone was smiling at me and welcoming me. The following 4 days my friend and a few other nuns showed me around the temple, explained things to me and asked me lots of questions. 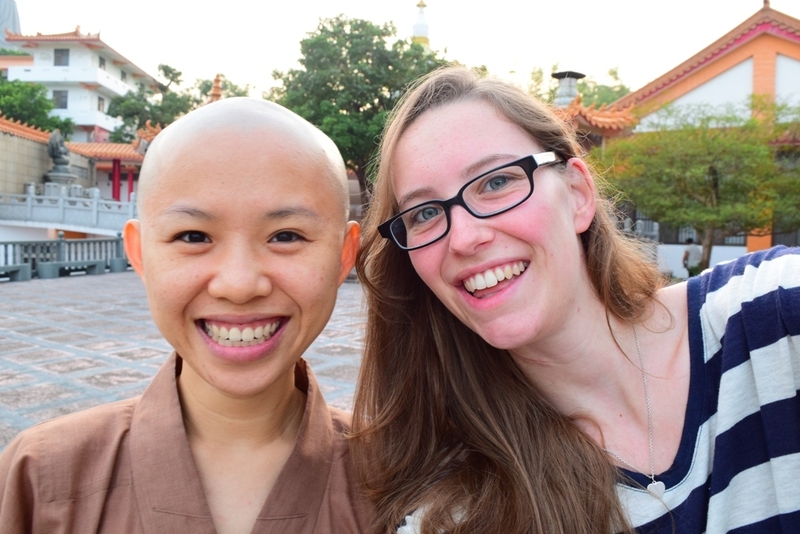 A Buddhist nun believes in different things and lives a different life to what I am used to. And also one should not forget that the Taiwanese culture is completely diverse from Western cultures. That made two new ways of living that I was confronted with. To me, used to Western standards, there were some really hard parts in that new lifestyle, which were food, sleeping habits and mosquitoes. The food habits vary from temple to temple. At the temple where I stayed, the nuns are all vegetarians. Their Buddhist teaching says, that no living being shall be harmed for whatever reason. You shall not even kill mosquitoes, but gently wave them away when they try landing in your face. Something I really couldn’t deal with as the mosquitoes ate me for breakfast, lunch and dinner… and also midnight snack. Had kind of a fight with so many mosquito bites. I was feeling horribly itchy 24 hours during the 4 days. And by the way I was hoping that I wouldn’t get Dengue fever, which was spreading in the region. It was not a problem, that the food was vegetarian. Vegetarian food is healthy and tastes good… I thought. But I was in Taiwan. There are different herbs and spices used for cooking. If you are not used to that kind of food, it is seriously hard to eat it. 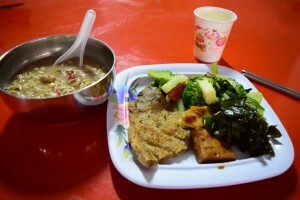 And by that I mean that Taiwanese countryside food is not what you know from Western Chinese restaurants. Not even comparable. I guess you slowly have to get used to that kind of food and that totally new taste. I can tell you that “stinky tofu” definitely tastes what it sounds like. Sorry my dear friend, I tried, but NO WAY, I couldn’t deal with it, hahaha! Another thing I had to fight with in the temple were the wooden beds without any mattress on it. The nuns somehow got used to sleep on just a wooden bed, and visitors do so as well or just bring a small mattress. I brought my inflatable mattress and was happy about it. I am impressed that the nuns sleep without problems on the wooden bed. Forgot to ask my friend how she learned to sleep like that. I guess this is why they meditate that much and have lots of different lessons in the temple that they attend each week. It helps them to grow their understanding of the right behaviour and this is what they can teach others. What they also see as a high priority is to educate people with their knowledge. So whoever is interested in anything that they can help with, is welcome to ask questions and also to take part in some lessons. Many volunteers work at the temple to keep it clean and give lessons. My friend told me that the nuns are that talkative because they like sharing their wisdom. I like that way of thinking. I was told that some of the nuns are specified in specific topics, like one of them knows a lot about Chinese remedies. But all of them had one thing in common: living a super happy life and sharing that with everyone who is interested in it. And I am thankful that I got to know these great people. There is way more that I could talk about, but that will come close to write a book, haha. For those who are interested, I will tell more about the life of a nun in my next post. That 4 day stay in the temple was the beginning of opening my eyes for new ways of thinking and that there is more in this world than what you grow up with. When you are open-minded to explore new things, people will feel happy to tell you what they know. So did the nuns. You just need to listen. And I thank them for sharing their knowledge with me. Want to see more pictures of my temple stay? 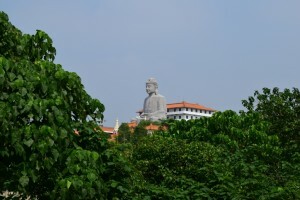 Take a look at the Taiwan galleries and videos. Have you ever been so lucky to experience a stay in a temple without hundreds of tourists? What have you experienced? Put it into the comments.